Windburn woke to Thornbow's grip on his arm. He blinked awake, disoriented at first � he had only just handed over his watch to his friend, hadn't he? But one glance at the grim look on Thornbow's face chased away the fog of sleep as effectively as a dive into freezing water. Reflexively, the chief sat up and rolled away from the pile of sleeping furs, where Foxtail continued to slumber undisturbed, Foamspray tucked beneath an edge of the sleeping fur at her elbow. Windburn crawled out of their shelter, an ice cave burrowed into the snowpack of a high ridge, among the feet of the last sentinel pines at the treeline of Tuftcat Hill. Their view out across the scrublands of the north and east was a clear one, and the dip of land there was protected by the pines and ridgeline from the worst of the winter winds. They had hunted well the day before, and had carried back most of a clickdeer doe to cache against the storm-scent on the wind. A big blow was coming in from the northern sea, and Windburn hoped all of his far-flung tribemates had taken similar precautions against it. **Snowfall, I am here,** he answered, aware of Thornbow's listening presence at his back. Windburn was immediately aware of how their elder's mindtouch was taut with tension, but there was no taste of adrenaline-laced fright in Snowfall's sending. **One-Leg is sending warning to me now,** Snowfall said, distraction evident as well in her sending-touch. Windburn's uncle was too far away to reach him directly, but Windburn had spaced his watch teams with this is mind � Snowfall could serve as the communication conduit if needed � as was needed now. Windburn responded with a wordless, respectful pulse � he was listening, and waiting for her to share what One-Leg had to say. Snowfall was silent for a moment longer, giving Windburn a moment of grim anticipation. Whatever his uncle was telling the Howlkeeeper, it was lengthy. He felt the swirl of her emotional patina � dismay was Snowfall's dominant response to the story she was being told, studded with bright bursts of dark amusement, no doubt due to One-Leg�s colorful way with words. Windburn could well imagine. He hugged his winter coat tight around himself and stood where he could look out over the northern scrublands. It was dusk, and the clouds were low in the sky; Windburn could see nothing out across the empty landscape except the flat reach of snow-covered ground below. There was no sign of game herds � nor of their hunters. Windburn heard Thornbow's sharp inhalation at that. He felt as physically immobile and unresponsive as stone, himself, while his mind took in that information and tried to go a dozen different sideways directions at once with it. **Can One-Leg confirm that he and Pathmark were not seen? ** he demanded, seizing on that element as the most important. The horn. The one One-Leg and Farscout had found, shortly after the Painted Faces� arrival. It had been a morbid novelty, which the chief had been happy to bury away out of reach of the cublings before he had forgotten about its very existence. But leave it to Notch not to forget � or to seek permission before unburying the twice-rotted thing. **So the humans know about the Fierce Ones' return,** he sent, trying to absorb that knowledge and to foresee whether it meant for his own tribe ripples or a shockwave. **One-Leg is saying that the word-hunters have had some close scrapes before, but that this one was by far the closest. He wants you to know his son's actions saved the humans from spotting him and Pathmark � and maybe from fishing him from out of the river as well. ** Snowfall relayed that message with as much neutrality as the calm, steady huntress could affect. Windburn trusted his uncle to protect Notch's hide � maybe the trickster had saved the day, but he had stolen the Fierce Ones artifact from tribal stores to do it, and no doubt had harbored that horn, just waiting for a dramatic opportunity to present itself. Windburn spared a moment's splinter-thought after that, long enough to wonder how much One-Leg himself had been in on that stunt � then shoved the concern aside to be gnawed on later. Who had done what � with what � did not matter so much now. What was important right now were the consequences of those actions. A cold gust of wind blew over the ridge, carrying a swirl of snow with it as it pulled at Windburn's coat and hair. He glanced back and shared a knowing look with Thornbow. 'Buy us time � for what?' was the thought in his childhood friend's eyes. He felt Snowfall's swirl of fear in the wake of those words. Windburn could not help but share it. His scouts would be in more danger than ever before � as would the Holt as well. The tribe had been preparing for invasion from the east. If Notch had stirred up a fresh hive of trouble, this trouble would come at them from the south and the west. **One-Leg acknowledges that,** Snowfall replied; Windburn snorted to himself, having no doubt that his uncle�s actual response had been much more colorful and profane. **What of True Edge and the others up at Bluestone Cave? ** Snowfall asked then, knowing as well as her chief that Fadestar had been in position to be in communication with Rainpace & Dreamflight at their post on Crow�s Ridge earlier that afternoon, but that Fadestar would linger for only a few hours before the girl made her return trip to Bluestone Cave. If Fadestar had already moved beyond reach, their kin up in the Bluestone Valley high country would be out of communication range for days. **Yes, my chief? ** came the steady question in response. **He did what? ** Both Rainpace and Dreamflight sent back to Goldspice in alarm. They had been working on setting up an additional, protecting fur cover for their shelter in preparation for the upcoming storm when the news arrived. **Notch said it was necessary. Otherwise One-Leg and Pathmark would have been discovered by the Painted Faces and Amber Hunters,** came the instant, albeit faint sending reply. Rainpace exchanged a worried look with Dreamflight: **What are the humans doing? Running to their village as fast as rabbits, I bet? ** Rainpace had stopped working on the fur cover and nervously started pacing on the ledge, his thoughts already one step ahead, weighing the possible consequences. This development was not good. They did not need more humans to worry about, no matter how harmless they had seemed to be so far. He remembered the first time the elves had seen the pale, woodswise humans. Then they had all been fleeing from the Fierce Ones, strong hunters as well as the more vulnerable of their tribe. Had still more of them stayed behind, to defend their former homeland? None of the elves could know that. **Will they search for the Fierce Ones in the woods? ** Dreamflight interrupted Rainpace�s open sending. She had managed to reach Fadestar, and there was the sense now that the younger elf was still linked into the conversation. Rainpace shot her a look, guessing what she actually wanted to ask: Would the Painted Faces be another threat for discovering the Holt? His heartbeat quickened. Rainpace had studied the local humans long enough to believe they would be no harm to his tribe, that befriending them would be beneficial for both sides. But this was definitely the wrong time for an encounter. Both elves and humans were too much on edge, accidents and misunderstandings could happen way too easily. **Calm down, Rainpace,** came the gentle, although firm, sending from Goldspice, who had noticed the rising panic in his sending. **There is no need to worry, yet. One-Leg and his group will watch the humans closely and will inform us about every motion. Maybe there are enough ships anchoring on the shore to take them in. We do not know this, yet. ** She underscored her sending with a strong sense of calm, urged on him like a heavy paw, trying to still his wild, chaotic thoughts. From the corner of his eye he saw Dreamflight warily watching him, and Bristlepelt below him started to mimic her elf-friend, pacing the snow while looking up at him. **Danger come? ** the wolf asked, her wolf-send a wave of anxiety mixed with human-scent and human-figures advancing through the snow. Rainpace could not muster a sending reply that would not enhance his wolf-friend�s agitation and flight instinct even more. Therefore, he only distractedly gave her the hand signal that everything was all right and retreated a bit from the rim, hoping Bristlepelt would calm down if she did not see how churned up he himself was. �Bristlepelt, don�t!� Dreamflight cried and interrupted Goldspice�s sending. Startled, Rainpace followed her shocked look just in time to see the wolf, who had climbed up to them, lose her grip on the ledge and fall. The muffled impact was followed by a heart-wrenching yelp. �Bristlepelt!� Rainpace shouted and ran to the rim. Looking down he saw his wolf-friend lying in the snow, one of her hind legs in an impossible angle. A splintered bone stuck out from flesh and fur, turning the snow red. **Rainpace? What is it? What happened? ** came Goldspice�s anxious questions. Being linked to him while the accident happened, she had felt his horror. All he was able to do in response was sharing in sending the horror of what he saw below him, as Bristlepelt struggled to rise and failed, hindquarters unable to bear her weight, while he scrambled down the rock wall, Dreamflight right behind him. �No, no, no, no,� he mumbled under his breath, while the agonized shrieks of his wolf rang in his ears. Instead of moments the descent felt like it took him hours and once or twice his feet almost slipped on the ice-glazed rocks. Reaching the lower ledge he approached the struggling wolf but before he could touch her, she snapped at him in her pain. The sharp teeth clapped together only a finger�s breadth from his hand. Now growling at him Bristlepelt tried to get up on her forelegs but fell back immediately with a high-pitched yelp. Keeping a safe distance Rainpace murmured soothing words accompanied by a sending, in which he showed her pictures of how they had shared a kill and a place to sleep so often and how he had removed a thorn from her paw once. Slowly her frantic attempts of crawling away from him slowed down, recognition blooming in her blood-shot eyes. Tentatively Rainpace stepped closer to the whining wolf, who still watched him warily. At his first touch, she snapped at him again, but without the former purpose of seriously hurting him. He gently stroked her neck to calm her further, painstakingly avoiding coming close to the lower, broken part of her body, yet. Before hope, as small as it was, could even spread, Goldspice interfered, **No, Willow, you won�t! ** Her mind-touch was steady and firm, though beneath it they could all feel a thread of regret � for the wolf�s pain, perhaps, or for the decision, or for being the one who had to make that choice. There was no mistaking her refusal, even if it made the phantom weight of the chief�s torc a little tighter around her neck. **What? 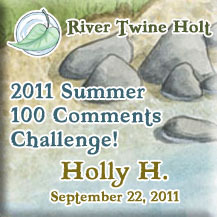 ** came the incredulous responses from Willow and Dreamflight. **Rainpace, how bad is she? ** Willow asked, her own sending jagged with emotion, not least of it an outright rejection of being commanded against what she wished to do. **I don�t know! ** he sent back, anguished. Bristlepelt was struggling again to rise � and again, horribly, her hindquarters were failing her. The bloody snow around her was stained yellow now as well, as her bladder dribbled dry. Rainpace hugged his wolf-friend�s shaggy neck and leaned his full weight against her, pressing her back down into the snow. Dreamflight finally dared to get close to the wolf, too, and kneeled down next to him. As Rainpace held his frantic she-wolf still, Dreamflight ran her hands down the length of the old wolf�s spine. As she reached the bones above Bristlepelt�s hips, her hands froze. Her green eyes flashed to Rainpace�s face, and the look she gave him was a mix of horror and resignation. He put his regret and love in a sending, which Bristlepelt was only able to answer with a glimpse of the pain that soared through her hip and legs. Rainpace knew what there was to do but he did not feel ready for it. **Willow, please stay at the Holt. Goldspice is right,** he finally managed to send. There was a pause, and then Willow replied to his sending with one of her own, a wordless, sympathetic, regretful affirmative. He could feel that she knew what he had to do, and was sorry the situation wouldn't allow her to come and help him. His sending had transmitted the grief he was feeling because neither Goldspice and Willow, nor Dreamflight asked him what he meant by this. Slowly Rainpace pulled his skinning knife from the strap around his thigh. He took Bristlepelt�s head in his hands, gently lifting it to expose her throat. He ignored the muffled sob from Dreamflight behind him and took a deep breath before he rammed his knife to the shaft into the soft spot behind the massive jaw. The wolf�s body weakly jerked once and fell still. After a long moment of silence, with only Fumble sniffing around her packmate�s dead body, Dreamflight started to howl in respect. Her wolf-friend chimed in immediately and after some breaths Rainpace joined them, too. The echoes of their howling were thrown back and forth from the mountain tops and lingered shortly even after they stopped. Wiping his eyes with his sleeves Rainpace said to Dreamflight: �It is not done yet.� She nodded in understanding. The least he could do to honor his wolf-friend was keeping her fur. Dreamflight pressed his shoulder softly and turned for the ascent to their shelter. Knife in hand, Rainpace set to retrieve what was left of an old, dear friend. Shaping trees in winter was a slow, cautious business. In spring, a tree was awake and vibrant, eager to sink taproots deeper and stretch newly elastic branches even higher, and the budding of new leaves was a heartsong that throbbed like a pulse. During the spring, trees welcomed a shaper's guiding touch with the eagerness of a new lover. In summer, trees became more languid � the heartsong had become a purr then, and a healthy tree curled into a shaper's touch like a bobcat kitten to its mother. Autumn was a time for gathering resources, harboring strength and caching the reserves deep in the roots, while brittle leaves changed color and dropped. Shaping in the autumn was a conversation, and a shaper had to woo a tree into the necessity of out-of-season growth. And in winter, shaping meant reaching deep into a tree's wellspring and waking it just enough so that sap flowed like syrup into the body where a shaper asked for growth � but a shaper had to take great care not to wake the tree too much, or great harm could be done. A tree woken in the winter could be woken too early, caused to bud too soon, and burned grievously by the frozen world around it. "...fall getting worse..." The sounds were shapes and colors, drifting like leaves on the edges of her consciousness, slowly falling and settling. "... are back... humans roiled... Notch... trouble..."
Evervale seized on that word, knowing it meant something, knowing it was important. She focused on it, clung to it as an anchor, and shook her head until she could feel the brush of her fur hood against her cheeks. The sap was clearing away slowly, like a cloying fog. She blinked again, and grew aware of the cold against her face, in her joints, in her bones. A third blink, and her eyes focused on Cloudfern�s face, looming close beside her own. He knelt beside her, his snowcat fur cloak held around them both. He smiled and patted her face with a gloved hand. "Do you hear me now?" he said. She nodded and let him help her to her feet. Cloudfern knew how it was to struggle back to himself after a swim through the wintertime sap. With great patience, he half-carried her as she stumbled in the snow, distracted as she was by the marvel of snowflakes as big and soft as feathers riding in the wind. Evervale gave her sister a quick hug as they moved into the Gathering Den. Cloudfern and Evervale had coaxed moonmoss into a luxuriant growth along the ceiling, providing a steady blueish illumination to the central part of the irregularly shaped chamber, although the jagged edges of the room fell into a deeper gloom. The rest of their group was already gathered there, waiting for their arrival. Starskimmer had shaped a cooking hearth in the southwestern part of the room, near where a low, narrow tunnel led toward the subterranean spring. A low fire burned there now, heating two cooking skins, one of herbal tea and the other of thick mushroom stew. True Edge, Starskimmer, Otter, Newt and Fadestar sat among their sleeping furs near the hearth, sipping on steaming cups. Both of the young scouts were wrapped in furs and looked exhausted from their trip back to the cave from Windy Ridge, and Muckabout was hovering busily around its favorite elf, trying to make sure Newt was warming up adequately. The rest of the group looked at Crackle and the two treeshapers, obviously pausing a conversation. From the grim looks on the circle of faces, Evervale knew at once that the �juicy bones� couldn�t taste of good news. Otter snorted and waved at the cave around them. �You call this easy?� he said. Reflexively, Evervale glanced at the cavern around them. In the past six and a half days since their arrival, the team had worked incessantly, but there was little yet to really show for their efforts. She and Cloudfern had one shaped treehome in a white alder along the creek, with a den large enough for two elves at most; the half-finished maple would be the second. Starskimmer had inspected the whole cavern complex and reinforced the two spots where she felt a rockfall was possible, before moving on to secure the two escape-route tunnels. True Edge and the cubs were trying to squirrel away a cache of food, but the winter hunting in the high country was a challenge, and if the coming storm snowed them in, they would have to closely ration what little meat and fish that they had. Cloudfern had a start on a mushroom-patch, in the dampest back cavern. He had already set aside enough deadwood during the past decade that there was ample rotting wood for that staple, the first harvest of which flavored the thick stew. �Otter just misses the privacy of his den,� Newt said, with a knowing wink for his friend. �It�s not,� True Edge said firmly. �We�ll be able to finish more after New Green comes, and the sap begins to warm up,� Evervale said, taking her first sip of the savory stew. �But it still won�t be the same,� Newt said, his expression mournful. �I don�t want to lose the Dentrees. I don�t want to lose the places my family has lived, or the handprints on the storage-den they�ve left behind.� Fadestar nudged him with her shoulder, sharing a meaningful look with him. �I don�t want to lose anything, especially not to some scruffy wolf-less round-ears!� Otter grumbled. �I was never!� Otter stammered, giving her a shoulder-punch in return. Blizzard winds were howling in gathering dark outside the Dentrees, their icy fingers clawing at the hides lashed tight over the windows. The snow storm had come in the morning and had not stopped all day. Above him, the high branches of the old Dentrees swayed in those chilly blasts of wind, sometimes creaking, sometimes groaning, like elders complaining to one another over the weather. Rill nearly jumped out of his skin. He spun around and fixed his fiercest glare on the girl who stood in the doorway from the Chief�s Den into Windburn�s living quarters, where Goldspice, Nightstorm, Willow, Suddendusk, Cinder, Chicory and little Glow all slept. Only Greenweave had returned to the habit of sleeping alone in his own den. "Nothing!" Rill stated firmly. �I�m not doing anything at all." Poised in the arching doorway, Copper merely stood and stared at him, her violet eyes enormous and almost unblinking. His quiet playmate had a way of doing that � of being silent and just looking, that just put a wind down Rill's spine. He hated it when she did that, because he just knew she was thinking something, but she wasn't about to share just what those thoughts were, and they didn't play across her face like they did most everyone else. Rill could always tell what was tripping through Glow's head, and Cinder was not all that much harder to figure out. But where Glow and Cinder were easy to read, Copper was like staring into water so dark, you couldn't even find your own reflection there. Worse � the longer she stared and the longer she stayed silent, the more twitchy she made him. Rill couldn't help himself. Copper could make him nervous sometimes just by looking at him that way she could, all owl-solemn and silent. It just wasn�t natural for anyone who wasn't hunting to be that quiet and that still. It just wasn't. "I was just checking my go-bag," Rill said, when he couldn't withstand that violet stare. "Making sure I had my second-best pair of gloves in it. Just in case." Copper's solemn expression did not change at his lie, not even the slightest flicker. It was like she knew somehow, like maybe she smelled the untruth on his breath as though he'd eaten whitebulb or something. She just continued to stand there and stare. He tried to stare back, trying to look as innocent as possible. He couldn�t hold her eyes for long, and found himself instead just watching his own booted toe trace a circle against the floor. "Just in case." Copper repeated the words back to him, and it was most assuredly not a question. "Goldspice said so, and she's acting chief with Windburn away," Rill said, trying to sound authoritative instead of just like he was still covering his tail. He reminded himself firmly that he was Copper's elder, by two years almost. That made him able to boss her around, or lecture her like a little cub. "Like, you could fall through ice and get your clothing soaked. You'd freeze if you didn't have extra gear." "Then stay away from the water," Copper countered. "Because if you fall through ice and get soaked through, you'll be wearing your pack and it'll soak, too. A soaked pair of extra gloves won't be any help to you then." Rill flashed his teeth, trying to look as fiercely stern as his mother Quick Fang could be. "But we'll all be traveling for Bluestone Caves together, so if one of us goes through ice, the rest of us will have extra winter gear to share. Your aunt is smart about the go-bags. Real smart." Copper continued to stare at him, steady and unyielding. "It's smart not to go alone," she agreed. "Cinder's hands are the same size as yours. Mine are not. Neither are Glow's." Rill scowled at that. He was still scowling and trying to parse out if Copper were really saying what he thought she was saying to him, or if it were just a truly innocent remark, when Copper pulled her blanket tighter around her shoulders, turned, and slipped ghost-silent back into the chief's den, back to her sleeping furs among the rest of their tribemates. Beneath him, Wasp kept a steady pace, confident of his way despite the white-out conditions around them. 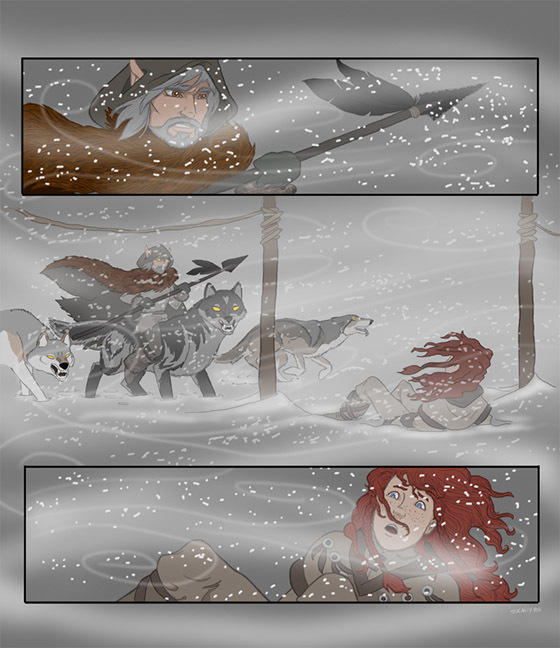 Frostback followed close behind the old wolf; ahead of them lay a faint path through the deepening snow. Blacksnake only hoped Fireweed had stayed with Redbrush and Duskgreeter when they had gotten separated from Wasp and Blacksnake in the storm. The trio had left their shelter to hunt shortly after nightfall. The dark approach of the blizzard from the west and the sea had been a curtain across the western sky, but the wolves were desperate for meat, and the trio had figured to take their chances with the storm rather than make the wolves suffer waiting it out. They might have risked the Fierce Ones� midden pile come nightfall, which was cluttered now with clickdeer bones. But the icy winds of the approaching storm had driven the Fierce One hunters back from their own hunt well before dusk, heavily laden with game and singing in loud celebration, and from the top of Lost Child Butte, the elves could see a large cluster of clickdeer not far to the northeast So as soon as the night had fallen enough for them to safely climb down from their snowcat den, the three elves had joined their wolf-friends and struck off to the north, wagering their lives and more on the hope that the Fierce Ones would be spending their night feasting and not venture forth from their camp in the face of the approaching storm. The hunt itself had gone quickly and almost too easily � Brightwood�s arrow had been the one to bring a young clickdeer down, and the elves had carved off some meat of their own before the wolves began their feast. Blacksnake had taken extra care to make sure that the source of the beast�s mortal wound was singled out for attention from their wolf-friends; the five wolves were hungry enough that it wasn�t long before the doe was little more than bones and scraps of hide. But by the time their bellies were full, the storm was upon them, and the icy gusts of wind had turned into a blizzard before they were even halfway home. The white-out conditions had enveloped them so fully that their separation had happened within a few heartbeats. Duskgreeter had moved up to take a turn breaking trail, and Wasp had paused for his rider to correct the shifting weight of the bundles of Preserver-wrapped venison Blacksnake carried. Brightwood and Redbrush had continued to follow after Duskgreeter, while the younger wolves had hung back to wait for their pack-leader. Fireweed had paused for several steps, looking back at them; by the time she turned forward again, Brightwood and Farscout had been swallowed by the driving snow. Blacksnake had finished rearranging his burden and nudged Wasp forward again, following the broken trail in the snow the three other wolves had left behind. Old Wasp continued to pace along steadily now, following those tracks as best he could. Blacksnake hated being snow-blind like this, and simply rode with his head bowed, able to do nothing more than trust his wolf-friend�s sense of direction. The brutal wind was even worse than the fast-falling snow, blowing the top layer into eddies and drifts that threatened to obliterate even the sign of three wolves pacing just ahead of them. When he risked a glance from beneath his hood, he could see only a faint crease leading ahead, but Wasp�s stride was confident as he followed the thin line of wolf-tracks. His eyes useless, Blacksnake�s thoughts turned to the last communication from his chief-son, the day before, and the news Windburn had passed on to them. He�d been shocked at first to hear of Notch�s use of the Fierce Ones� horn � shocked that he himself hadn�t thought of the wretched thing, or given a thought to how it might be used to trick the humans. Grudgingly, he had to admire it as a tactic. He couldn�t think of another, better way to have stopped the local humans dead in their tracks, or to turn them back. He didn�t think the howling of wolves would have done it. He was even grateful that it had kept One-Leg and Pathmark from being spotted, and he didn�t want to think of how close his brother had come to death � didn�t like the way this crisis was making all of them take such risks, having to act with so little careful planning. Well, there was nothing to be done about it now. The brownskins and their woods-wise allies were warned. If the Painted Faces still feared the Fierce Ones the way the elves did, then they were good and stirred up. He wasn�t sure if they would stay in their dens and wait for further signs of their enemies... or like the elves, if they would range out to find them, see them with their own eyes, know what they were doing. At some point, Blacksnake knew, he and Farscout and Brightwood would have to be alert for those Painted Face scouts. But at least, not right now. His thoughts then turned to the hunting scene they had just left. He thought of the clickdeer they had killed, and of how successfully they had been able to direct the wolves in destroying the evidence of the killing arrow. That was a worthy trick, something he could savor, and think how it might be used to their advantage again. He thought of the encounter they had had with the Fierce One scouts, six days ago now. At the time, Blacksnake had almost fired his bow on the humans -- it was only the uncertainty of how to hide the killing that had stayed his hand, in a moment when he had felt them almost certain to be discovered. The moment had passed � but not the hair-triggered fury he still felt at Brindlefur�s death. His speculative thoughts vanished as Wasp rocked backwards beneath him. He looked up, past Wasp�s head and between two forward-facing ears, expecting to see the foot of the butte before them. There was another wolf just ahead, a glimpse of reddish coat that could have been either Redbrush or Fireweed, and a moment�s relief at catching up to his companions gave way to surprise that they had waited for him instead of starting their climb as he�d told them to. He saw a fur-swaddled figure emerging from the white swirling wall of snow, and Blacksnake�s mind tried to make the figure into Farscout � same height, same build � even as the figure stumbled backwards in equal surprise, and a fur-trimmed hood fell back on hair as red and flyaway as his niece Crackle�s. Human! Blacksnake realized, as his heart slammed out of his chest. Fierce One. Wasp yelped and swung sideways, too startled by the sudden apparition for aggression. Blacksnake raised his spear in self-defense, as the Fierce One fell flat on its back in the snow, smothering the trail beneath it. Belatedly, Blacksnake saw a post in the snow near the humans� elbow � Gateposts! What trail has Wasp been following? The answer came in the next breath as Fireweed bolted past them. The human was scrabbling backwards through the snow on its back like a crab, mouth agape. Freckles stained the human�s white cheeks like flecks of dirt, and Blacksnake saw the Fierce One�s eyes, wide with terror and as ice-blue as his son�s. Bewildered but still frightened enough by the boy�s abrupt appearance from the storm, Wasp submitted to his rider�s command. The old wolf ran, for a moment skirting the curve of the rope that marked the perimeter of the Fierce One�s camp. Blacksnake looked back to make sure the younger wolves were following, and saw only a glimpse of the frightened child left huddled behind them before the snow swallowed both the gatepost and the boy up.